The Food and Drug Administration (FDA) in the United States and TÜV Rheinland (TÜV) in Germany are organizations involved with safety standards for various products, including laser and other opto-electronic devices. The labels presented below are required in many nations. Additional information can be found in Laser FAQ's. 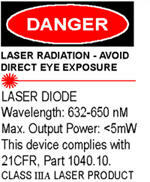 Laser radiation can harm the eyes if you look directly at the laser beam. Laser products should not be used by children, and should never be pointed at people or animals. 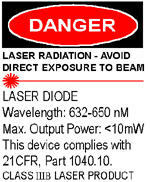 You should never look directly into the aperture of any laser product while the laser is in operation.